More than a decade after September 11, 2001, homeland security remains a challenging issue for the United States. Recently, the Center of Academic Excellence Program at Maryland (CAE@M) hosted its spring colloquium, which featured speakers from the Department of Homeland Security (DHS), the National Consortium for the Study of Terrorism and Responses to Terrorism (START) and other University officials. The event discussed homeland security across a range of applications. The CAE@M Program is part of a nationwide effort designed to encourage students to consider careers in national security professions. The University of Maryland is one of 14 schools operating CAE programs, which not only offer career opportunities in intelligence, but also exposes students to careers in the Foreign Service, military, and national and local homeland security agencies. The CAE@M Program's theme for this year's spring colloquium was "Homeland Security, 2001-2020." The event began with a networking segment where representatives discussed career opportunities and their personal experiences. Participants included Tim Sampson, director of the Border Security Division with the Department of Homeland Security, and Lavertta Tilghman, who works within the Equal Employment Opportunity Office with the National Security Agency. The following segment featured a panel of homeland security experts who discussed advances in security and relationships that have formed since the terrorist events of 9/11. 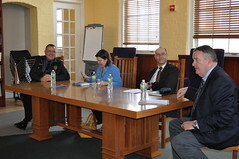 The panel was made up of four homeland security experts, including START's own Gary Ackerman; David Mitchell, director of public safety and Chief of Police at the University of Maryland; Melissa Smislova, associate deputy director for analysis at DHS; and William Nolte with the University of Maryland's School of Public Policy. The remainder of colloquium consisted of a discussion regarding the critical homeland security issues of the coming years and cyberspace's role in changing the homeland security agenda. Contributors included: Barbara Alexander, director at the Office of Intelligence and Analysis with DHS; Allison Reardon, senior manager with ITT Exelis; and Michel Cukier from theMaryland Cybersecurity Center(MC2).